Recent results of Ajtai on the hardness of lattice problems have inspired several cryptographic protocols. 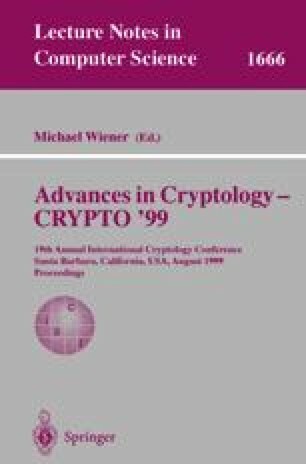 At Crypto ’97, Goldreich, Goldwasser and Halevi proposed a public-key cryptosystem based on the closest vector problem in a lattice, which is known to be NP-hard. We show that there is a major flaw in the design of the scheme which has two implications: any ciphertext leaks information on the plaintext, and the problem of decrypting ciphertexts can be reduced to a special closest vector problem which is much easier than the general problem. As an application, we solved four out of the five numerical challenges proposed on the Internet by the authors of the cryptosystem. At least two of those four challenges were conjectured to be intractable. We discuss ways to prevent the flaw, but conclude that, even modified, the scheme cannot provide sufficient security without being impractical. ECCC. http://www.eccc.uni-trier.de/eccc/. The Electronic Colloquium on Computational Complexity. O. Goldreich, S. Goldwasser, and S. Halevi. Challenges for the GGH-Cryptosystem. Available at http://theory.lcs.mit.edu/~shaih/challenge.html. The LIDIA Group. LiDIA-a library for computational number theory. Can be obtained at http://www-jb.cs.uni-sb.de/LiDIA/linkhtml/lidia/lidia.html. V. Shoup. Number Theory C++ Library (NTL) version 3.6. Can be obtained at http://www.shoup.net/ntl/.